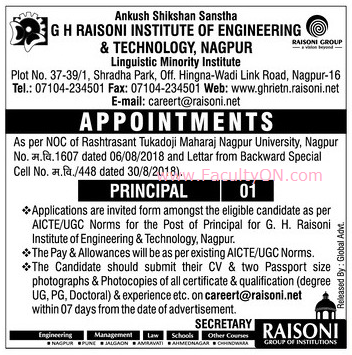 G.H.Raisoni Institute of Engineering and Technology, Nagpur has advertised in the LOKMAT newspaper for the recruitment of Principal job vacancy. Interested and eligible job aspirants are requested to apply within 07 days from 22nd September 2018. Check out further more details below. About College: G H Raisoni Institute of Engineering and Technology was established in 2008 and commissioned with a very specific aim of creating a niche, wherein they can enjoy a precinct of their freedom and attain the excellence while being in a distraction free and truly competitive milieu. The institute offers courses in an array of engineering disciplines that cater to the up to date need of the contemporary market in terms of the public and private sectors. The departments available with the institute run the courses affiliated with R. T. M. Nagpur University, Nagpur and the syllabi specified by the Board of Studies are meticulously followed. How to Apply: Interested and eligible candidates are requested to submit application along with CV, xerox copies of certificates and 02PP size photo to the following email address.